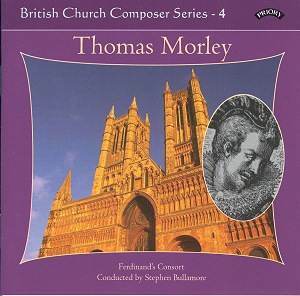 Thomas Morley was one of the most prolific composers during the 'Golden Age' in English history under the rule of Elisabeth I. How much she was considered responsible for the flowering of the arts is impressively demonstrated by 'The Triumphs of Oriana', a collection of several composers’ madrigals put together by Thomas Morley in honour of the Queen. He himself was a productive and distinguished composer of madrigals, which were strongly influenced by Italian contemporaries. His many works in the genre have overshadowed his sacred output, which has been largely neglected. A search on the internet suggests this recording by Ferdinand's Consort is the only one available entirely devoted to the sacred music. Morley was born in Norwich, where he became master of the choristers of the cathedral in 1583. He had been the pupil of William Byrd: when he published his treatise 'A Plaine and Easie Introduction to Practicall Musicke' in 1597 he dedicated it to Byrd, calling him his master. It seems that he became organist of St Paul's Cathedral in London at the end of the 1580s. In the ensuing years he began to compose madrigals, the first collection of which appeared in 1593. Morley was also active as music publisher and printer. In 1598 he received the patent on music printing, which had been in the hands of William Byrd until 1596. Apart from some contributions to collections of psalm settings he himself published none of Morley's sacred music was printed during his lifetime. Publications of his works after his death are not always considered reliable. For performances one has to look into the sources, but - as John Bawden writes in the booklet - these give considerable problems as in most cases some partbooks are missing. The well-known British musicologist Thurston Dart has been one of those who has been active in reconstructing Morley's sacred works from original material. Most of the present disc is devoted to music on English texts. The First Service is the largest of Morley's three services. The stylistic differences of the sections of this Service suggest it wasn't written as a unity, but rather put together from pieces composed at different stages in Morley's career. It is remarkable how little of Morley's madrigal style has left its mark on this music. There are several moments where the text is illustrated in the music, but elsewhere there seems to be no direct connection between text and music. Several sections are written in the style of the verse anthem. The verses are sung by members of the ensemble, and it is here that I am most disappointed by these performances. Some singers use excessive vibrato, which is especially annoying in these solo sections. But they also undermine the overall sound of the ensemble. The Burial Service is a short collection of pieces on texts from the Book of Common Prayer of 1552. Several of these texts are better known from the settings by Henry Purcell: 'Man that is born of a woman', 'In the midst of life we are in death' and 'Thou knowest, Lord, the secrets of our hearts'. These pieces are very moving, and they are pretty well sung, although their emotional impact doesn't fully come through. One of Morley's best pieces is the motet 'De profundis clamavi', but here it is partly spoilt by the sharp, unpleasant sound of the tenors who almost overpower the rest of the ensemble in the first phrases. The performances on this disc aren't quite what I was hoping for. I have to admit that I find it difficult to appreciate this repertoire sung by mixed choirs and vocal ensembles. I strongly prefer performances by male voices alone. Quite apart from that these performances too seldom really come to life. The fact that this disc is the only one available devoted entirely to Morley's sacred music is the only reason to recommend it. Let us hope some British cathedral or college choir is going to deliver a recording which does full justice to this fine repertoire.